Discussion in '2nd Gen. Tacomas (2005-2015)' started by Soundwave, Oct 10, 2010. Since we are all dieing with anticatption to see what the 3rd Gen Tacoma looks like, I was wondering if anyone with some graphic design skills on this forum would try to photo shop the front of the new 2010 4runner with a pickup truck box? 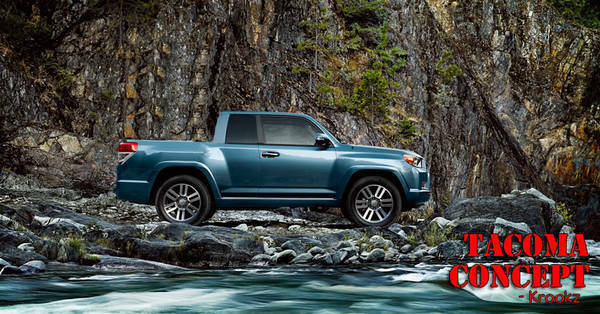 Since the Tacoma and 4runner usually share some design similarities, this might give us some idea of what to expect? Might as well buy a Honda Ridgeline or Chevy Avalanche ... examples of non-pickups. it'll obviously be different than these, even if they do take on the new hoerunner body style. the taco will definitely not go unibody. would be awesome if they went the route of a mini tundra style and not the runner style. Would be awesome if they gave us a goddamn diesel, a Double Cab Long Bed w/6 speed manual. Cmon Toyota.... How many times must I repeat myself?! I like the front end of that tacoma concept. but from the side, thats gross.